As I type this post, I am sipping Ahmad Tea's Cardamom tea - a delicious warm brew that is perfect for the current weather - makes me forget the wintry snap and brings back memories of India. In most Indian homes you will find powdered Cardamom which is used to flavour tea. I have grown up drinking spiced and flavoursome tea. Even now I use Cardamom and Ginger powder to flavour my morning tea. 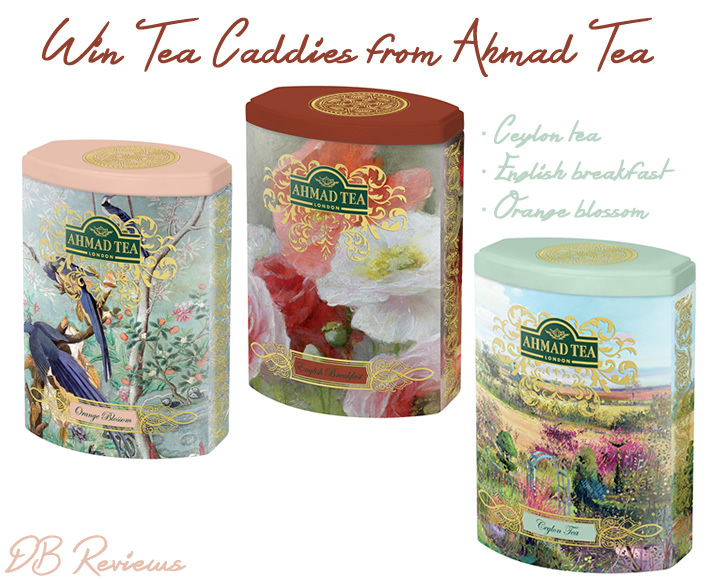 Well, moving on, I was recently contacted by Ahmad Tea and was sent some of their teas for review. And they are also hosting a giveaway for my readers. More about the giveaway at the end of the post, first I will share my views on the teas that I tried. First up we have Mint Mystique which is a lovely blend of green tea, enhanced with the aroma of mint. I have tried this tea both hot and cold and enjoyed it in both cases though I would recommend trying it iced. It offers a more refreshing experience that way. The combination of mint and green tea is lovely - it has a nice balance of both the flavours. If you like mint tea or are interested in trying out green tea then I would recommend Mint Mystique for its subtle and natural flavour. The Detox tea is an infusion of natural herbs, roots and leaves with Ginger and Peppermint. It also has Fennel, Dandelion, Birch leaves, Rosemary, Nettle and Sweet Blackberry. That's a lot of herbs but surprisingly all were complementary to each other. It is a very harmonious blend and makes for a pleasant drink. One of the nicer detox teas that I have tried. And finally my favourite of the trio - the Cardamom tea. It has a very fine taste of Cardamom - not dominant, subtle yet rich in taste. I enjoy my Cardamom tea with milk and this one offers the perfect warming experience. It is a very lovely blend that I would recommend with no hesitation. *Items sent for review purposes. Peppermint tea - it is nice and refreshing! I love Ahmad tea's wild strawberry tea, smells/tastes amazing! I love green tea! It's really refreshing and the perfect pick me up! Chai. It's so milky and spicy and just a unique taste! I'm a big fan of Earl Grey tea as a special treat. Always feels that bit more luxurious than the regular tea I drink bucketloads of at the office. English breakfast tea. A nice smooth tea to start the day. English Breakfast tea, it's what I'm used to. I love trying new teas, but I keep coming back to English Breakfast. Never had orange blossom tea but as I adore the smell of this fragrant plant I'd be very keen to try it. Ceylon is very civilised for the afternoons. My favourite tea is Earl Grey. I live to enjoy a cup of tea in the afternoon. Full of flavours. Black tea I just really like the taste. I like MacKenzie's Scottish Label Teabags they are only 95p for 80 at Aldi and make a lovely cup of tea. Much stronger than the leading brands at three times the price. Love trying new teas - I would love to try the Cardamon Tea and the Mint Mystique. Fingers crossed. I love Green tea, it makes me feel energetic and calms me down when I need to de-stress. I love peppermint tea, as it seems to help with digestion! I love darjeling but also love a builders brew! Rosehip and hibiscus, I don't like tea at all! But my daughter adores all sorts of tea, Assam, green tea, fruit teas, she loves trying new sorts. English breakfast tea, so refreshing. Breakfast tea during the day and a lovely cup of green tea before bed. I love peppermint tea because it is so good for the digestion. Peppermint tea - so refreshing! Earl Grey - just hits the right spot.